"Corprus weepings are hardened secretions that fall from the fleshy sores of corprus victims." 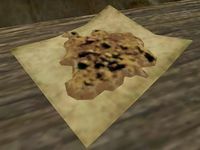 Corprus weepings are found on the bodies of corprus stalkers and lame corprus, which can be found in the areas worst hit by the blight, Red Mountain and most Sixth House strongholds. This page was last modified on 7 March 2016, at 13:50.